The compact Kubota RTV400Ci-A features a reliable 16HP Kubota air-cooled petrol engine paired with advanced transmission and inertial clutch for excellent response and reliability. Hauling up to 200KG of materials in the cargo tray, the RTV400Ci-A is ideal for general purpose use, including g p p light work around the farm and worksite. Powered by Kubota’s 15.8HP liquid-cooled EFI petrol engine and paired with Kubota’s innovative variable hydrostatic transmission, the RTV500G-HD offers outstanding reliability for years of dependable use. Powered by a reliable Kubota 21.6HP, 3 cylinder diesel engine, the RTV-X900W-H is complimented with a smooth VHT-X transmission, strong steel frame, independent rear suspension and worksite tyres. Powered by Kubota’s rugged 24.8HP, 3-cylinder diesel engine, exclusive Variable Hydro Transmission (VHT-X) and alloy wheels. 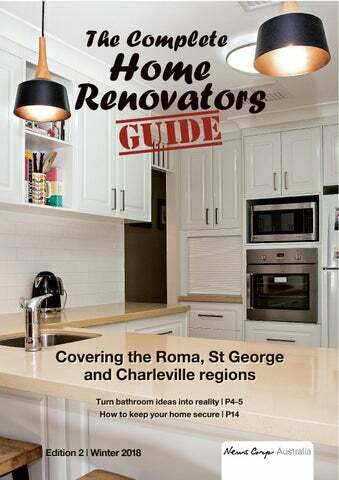 A BIG warm welcome to this year’s edition of our The Complete Home Renovators Guide. If you are pondering over the prospect of renovating your home, then this edition is a must read. Whether it be the entire house, just one room or perhaps your yard, there is something inside these pages for you! From the back patio to the bathroom and everywhere in between, including the yard, we’ve got it covered. Are you thinking about sprucing up the pool ready for summer? We’ve suggested some simple ideas, such as LED lighting or changing the waterline tiling to give a more modern feel and look. We have also included quite a few interior ideas, such as flooring options, patio and deck upgrades, bathroom brightening and sturdy re-restumping, just to mention a few. With great advice and beautiful images, we are sure to inspire your creative mind. High on the hill and solid as a rock. THERE are lots of things to think about when you are planning to renovate your bathroom. Here are a few suggestions to help you get the look you are after without breaking the bank, plus reminding you of some fundamentals such as storage and how you can never have enough. Think about what you do and don’t like about your current bathroom. Then put together a scrapbook of any new features, fixtures and fittings you’d really like to have when you renovate. Collect a few sample tiles and colour swatches so you can see how colours and textures will work together. Consider where your current bathroom plumbing and electricity are positioned in the room. The less you need to reposition these, the less you will need to spend on trade professionals. You should also consider how well your old inlets and outlets will work with new fixtures and fittings. Measure up the whole room to work out how much space you have to install any new fixtures and fittings. Remember you can never have enough storage – especially in a bathroom – so think about ways you can fit some more in. Don’t forget that all wet areas such as bathrooms must be waterproofed. Step 4: Think about your bathroom’s finishing touches HELPING HAND: This step-by-step guide will help any prospective bathroom renovator. Think about the finishing touches for your bathroom and how they tie in with your fittings. If your space is small, consider using large tiles to make the room feel larger. Smaller, mosaic tiles are a great option if you want to draw the eye to a detail or make the room feel cosy. The 60-30-10 rule is a good guide when using colour in the bathroom. 60% of the room should be your main colour, like white tiles on your wall and glazing on your bath or sink. 30% is your mid-range colour and is good for areas like the floor or vanity cabinet. 10% is your accent colour, a bold, punchy colour that you can add with your linen. A final thing to consider is where you put your towel rails and toilet roll holder. Ideally, you want everything within easy reach. The towels should be close to the edge of the shower. The toilet roll should be somewhere you can reach when you are sitting. MAKE A LIST: What do you want in your new bathroom? Write up a list, and check it twice. DoINeeD aBuIlDINg PermIt? If you are proposing new building work or renovations you will need a building permit either from Council or a Private Certifier. An application form plus scaled plans of the proposed work will be required. The plans must include a site plan, floor plan, elevations and foundation details. You may require an owner builderâ&#x20AC;&#x2122;s approval from QBCC or your builder may be required to obtain QBCC insurance. Council building staff will be happy to assist and advise you on your individual application. Any electrical or plumbing work involved will need to be carried out by a licenced contractor. cooler in the warmer weather and in return reduce the energy costs. According to the Australian government, approximately 40 per cent of household energy is used for heating and cooling to achieve thermal comfort. By choosing the right building material for your climate, you can help to reduce these associated costs. So do your homework and research the choice of materials in relation to where you live. WHAT WORKS: Consider climate and practicality when selecting building materials. FUN IN THE SUN: A few simple design alterations (like LED lighting, inset) can breathe new life into your pool. IT’S POSSIBLE to make dramatic changes to your pool without spending a fortune and even enabling your pool to run more efficiently. Feeling a little dissatisfied with that old backyard swimming pool? Maybe you moved into a house that already had someone else’s idea of a dream pool. Or perhaps you installed the pool years ago when styles and standards were different. Maybe you never got the pool you really wanted because your installation budget was limited. Whatever the case, the cost of a major pool renovation is probably more than you want to pay. Here are a handful of swimming pool renovation ideas to consider if you’re looking to get the most bang for your buck. Of course, if your pool has serious structural or equipment problems that need to be fixed, there’s probably no getting around a costly renovation project. These ideas are aimed at making an outdated (but still functioning) pool look nicer and operate better with a minimal investment. different colours. They make it easy to add your own personal sense of style to your pool scape. While it’s not cheap by any means, resurfacing can be a solid way to use your remodelling budget. That’s because it improves the looks of your pool, while also serving the practical purpose of replacing something that wears out over time. If your pool currently has a simple plaster finish, an update could also make your pool look more modern. These days, many people choose aggregate finishes that come in different colours and incorporate stones, shells, or other materials. Simply updating waterline tile can give your pool a more contemporary look. Combine it with deck and/or pool resurfacing, and you might think you have a whole new pool. big plus. This a cost-effective upgrade as salt water pools are generally cheaper to maintain. While they might stretch your remodelling budget, things like waterfalls, scuppers and sprayers are often pretty easy to add into an existing pool design. Thus, for a reasonable installation price, you can breathe some life into a lacklustre pool area with motion and sound. If you’re going for practical updates, there are a whole host of features designed to make your pool less expensive to operate. The main one to consider is a variable speed pool pump, which uses less electricity and may even qualify for an energy rebate where you live. Other popular options include energy efficient filters and solar-powered features (heaters, lights, etc). Pool technology is continually evolving, and a lot of the newer gadgets can easily be retrofitted to older pools. A lot of this high-tech equipment makes life easier for a pool owner, and could even enable you to fire your pool guy. Some things to consider include robotic cleaners, automatic pool covers and all-in-one pool automation systems (some of which can be controlled through a smartphone). Enclose your patio, porch or deck HAVE you been thinking that the downtime you spend on your patio, porch or deck could be even better if you enclosed your existing patio, porch or deck? With several options available, now is the perfect time to explore them. First, let’s explore your motives for wanting to enclose your deck or patio. Are the bugs, the wind and weather, or the hot sun bothering you? All are legitimate, logical reasons for putting up a transparent barrier between you and the elements. surrounding you. Insects will stay out, but the breeze and natural ambiance will remain unhindered. A handy hint: Choosing black aluminium screens will make them practically invisible! Depending on where you live, this type of sunroom should be comfortable during every season apart from winter. You can choose between single or double-pane glass, according to your needs and budget. This type of patio or deck enclosure cannot be climate controlled so a simple ceiling fan should do just fine. enticing, weather resistant and bug-free sunroom to enjoy all year long. Combine this with double-pane glass walls with insulation and a full climate control system, and you’ve just built yourself a brand-new living area which might become your all-time favourite. Popular with the sun-worshipping crowd, and just as fashionable with stargazers, the solarium is a room that’s covered, top to bottom, roof to walls, with wonderful glass. You and your family will be able to take in not only the warm sun and blue sky above, but also the inspiring wheel of ever-changing constellations at night. FRESH OUTLOOK: An enclosed patio, porch or deck keeps the sun in, and the elements out. Do a quick assessment of what you already have and what needs to be upgraded. By going through each room and detail you can see what needs to be done and what doesnâ&#x20AC;&#x2122;t, and this can help with cost cutting. When coming up with a concept for your renovation or build, it pays to get the advice of a professional. If youâ&#x20AC;&#x2122;re looking at something relatively minor, then a builder would be the best to offer expertise. 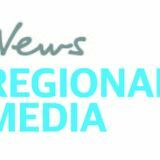 However, if you are looking to design something more complex and timely, a designer who specialises in that area would be needed. DO YOUR HOMEWORK: The more initial planning you do, the better off you will be. Have you heard that saying that you have to spend money to make money? Well this can be applied when looking at making improvements to your home. Consider investing in quality materials that will last and designs that will help lower energy bills and water costs. It is easy to get carried away when planning your renovations, but make sure you allocate a budget and stick to it. To help work out the total cost of the improvements you can obtain preliminary costs for each stage of the build. It is best to get a few estimates from different builders to ensure you are paying the right price and it will make for a more accurate estimation of the overall cost. Here’s a few things you’ll need to consider when selecting the right flooring THERE are many different kinds of flooring on the market today and lots of new ‘green’ flooring products. But it can be difficult to know where to start. Flooring has a major influence on the feel and mood of a room, it’s important to make the right choice. And, ka-ching, it’s expensive, so even more reason to get it right. You have to consider how much traffic it’ll get and factor in maintenance and durability, as well as appearance, comfort and cost. Soft flooring options include carpet and natural fibre alternatives such as sisal and jute. They are comfortable to walk on and good for insulation. They are relatively easy to maintain but aren’t as easy to clean as hard floors and stains can spoil the look. Hard flooring options cover timber, tiles, polished concrete, cork, rubber and vinyl. They’re easy to clean and durable for those high traffic areas. Hard flooring can come in an unlimited range of styles however they can be pretty hard on the feet if you’re standing a long time. Other things to consider: You need to choose flooring that works with the purpose of the room or the area. with the paints. Since kids spend a lot of time on the floor, softer coverings may be more comfortable. Consider cheap polypropylene carpet, cork or vinyl. When it becomes the teenage retreat, you can replace it. Or not. Asthma and allergies an issue? There’s a lot of conflicting research about whether people with allergies should have wall-to-wall carpet. Allergies are often caused by house dust mites, which thrive in warm, humid environments and are commonly found in carpet, bedding, soft furnishings and clothing. However, there’s also a growing body of research that suggests carpet actually traps the dust mites rather than allowing them to become airborne and is therefore more beneficial to allergy sufferers. While research continues, many experts are still advising people with allergies to go for hard floor coverings that can be easily cleaned. Talk to Tanya TODAY for a tailored solution to your pest problem. tradesperson for something you have already begun! We know tradespeople are not always available to drop everything and help you out, so you may be in for a bit of a wait before your problem can be rectified. Not only would this situation be a little embarrassing, it could be a costly exercise that ends up costing you more than it would have had you not sought help in the first instance. You may also have to consider your insurance when doing your own handiwork. If anything goes wrong either with the “job” or yourself, you or your house may not be covered! So, sometimes it is best to get help to tackle a home maintenance project or small renovation or update before it becomes a disaster. This also ensures the job is done correctly the first time and will be a professional finish. DIY? NOT ALWAYS: You may think you’re handy, but some jobs are better left to professionals. STOP IT DEAD: Early intervention, and the right advice, will prevent pests and rodents ruling the roost in your home. pest control needs will safeguard your property from a range of pests including termites, cockroaches, spiders, silverfish, mice, ants, wasps, fleas, flying insects and so much more. With a range of options available to you, professionals can put the necessary precautions in place to stop even the toughest rodents getting inside. Rodent and insects can hide out of sight, so regular pest screenings are a vital defence strategy to stop these little creatures from moving in, and provide you with peace of mind. Using a reliable, local pest control company means that any problems that may arise can be easily sorted and will not snowball into bigger issues down the track. 54 Partridge Street, Charleville 3 built-in bedrooms, main with ensuite, spacious combined lounge and dining area and second lounge room, stunning black two pack kitchen overlooking the pristine salt-water pool and spectacular outdoor area with a waterproof Balinese thatched roof pergola. Main bathroom with a stand alone claw foot bath and separate shower. the laundry has a ramp which leads to the back yard where the 2 bay carport and 6m x 6m garage with built-in shelving and garden shed are located. SAFETY FIRST: CCTV cameras and coded entries not only boost security in your home, but provide peace of mind. enter the house will often act as a deterrent in itself. Having an alarm system that screeches if someone is trying to break in to your home is often thought to be the best deterrent of someone tyring access your house. By combining both an alarm system and CCTV systems you will be providing the best deterrent to unwarranted guests â&#x20AC;&#x201C; and will help give you and your family some peace of mind. Servicing the South West region with quality service and products Book in now!!! AS WE all know, choosing the right furniture is more than falling in love with its initial beauty. The style and construction of the furniture has to last many years, so considering the distinct details and quality of construction of a particular piece is a good way to help seal the deal, and a little pro guidance never hurts. ■ Construction: You want the furniture piece to feel solid and heavy. Avoid particleboard and light aluminium frames and stick with solid wood construction. Solid wood frames will generally last much longer. However, make sure that the price is consistent with your expectations for how long the piece is going to last. The cushion is also an important point to consider when looking at construction. Before purchasing anything, give it the sit test. No matter how beautiful your new upholstery piece is you won’t enjoy it if it’s not comfortable. ■ Silhouette: Is the general shape of the piece trendy or will it stand the test of time? A piece of furniture is an investment in your home and says a lot about you. Choose a silhouette that you will love now and in the future. This doesn’t mean, however, that you should choose something shapeless or without style. Whether your preferences are contemporary or traditional, there are many updated options available on the market. ■ Finish: If your piece of furniture has any exposed wood, the stain or finish colour is an important point to consider. Many pieces can be altered dramatically by the colour of the finish. You can easily take a chair from traditional to contemporary by changing a cherry stain to a black paint. Likewise, a mahogany piece painted white will instantly appear more feminine. ■ Fabric: Lighter coloured fabrics can be appropriate for a formal living room, foyer, or bedroom. However, if this is a piece of furniture that will be used frequently, it is suggested to choose a slightly darker fabric. ■ The Unexpected: Look for furniture that has an element of the unexpected or has some personality. The overall shape of the piece could be a little unconventional, or maybe there’s some interesting tufting, or nail head detail. Either way, your personal style should be reflected in the piece of furniture that you choose. COMFY OR NOT: Take the ‘sit test’ for any prospective furniture purchase. 9 ROSEDALE CLOSE • 160 acres, shed style 2 bed cottage, • 3 bay shed, 3 stables, day yards • cattle yards & loading ramp. Shared bore. • Quality built 5 bedrooms, all with BIR • Renovated in a classic neutral palate. • Kitchen with stone bench tops & 2pac fascia. • On approx..160acres, private bore. • 3 bed, 1 bath, lounge, Modern kitchen. • 3 bay shed, machinery shed, truck shed & carport. • 4 bed, master with ensuite & walk in robe. • Combined kitchen/dining area. • Ducted evap air-con & DLUG. OUR homes require different lighting for different rooms, yet lighting in the home is one thing that can be overlooked and left behind when we consider renovations or updating. It is not practical to have beautiful mood lighting in the kitchen while you are trying to peer into the frypan. Nor is it a pleasant experience to have bright spotlights in your bedroom to greet your blurry eyes first thing in the morning! There are two basic components when thinking about lighting in your home. The first consideration is: What you would like the exterior light cover to look like? Should it be a show piece or discrete? Should it be big or small? What colour should it be? Just a few decisions to start you off. And of course, is that decision going to run through the entire house or differ between rooms? The second consideration is: How bright you would like the globe (together with what style of globe)? The globes available now are amazing but can also be quite expensive. There are pearl, clear, white, LED, halogen, fluoro and then there are the more modern, decorative filament globes as an option also. Most globes have an energy rating and details on the average amount of hours the globe will last. Together with choosing the “look” you are after, there is also the energy usage that needs to be considered. Those rooms that are more often used, such as the lounge and living areas may have the lights on for many hours at a time, so the power bill and the globe hours also need to be considered. Lighting shops are a little harder to find these days but well worth a visit. Staff are experts in their field and can advise you on any of your lighting needs. They also have great displays of ceiling lights, pendant lighting, lamps and night lights, which can help immensely when making decisions on styles and practicality. Another option for seeing displays of choices of lighting is at your local hardware store or pop in to any display homes that may be in your area. Lighting is a very personal thing and there are a lot of variables in each and everyone’s homes which makes them unique to different requirements. It’s certainly a case of what may look good in one home may not suit another. Different wall colours and furnishings make such a difference, so a lighting specialist is a great option for your first port of call, even if it is just for a discussion to start the creative ball rolling. cool to have those themes then and they may like a queen sized bed too! It is a good idea to keep the walls in any of your bedrooms a little toned down, perhaps just having one feature wall (which can be repainted at a later date) and simply accessorise the room with themed doona covers and rugs/mats and maybe a painting or two (or stickers in the kids rooms – easy to remove too). Being a little conservative with colours and themes will keep the costs and effort to a minimum to update as trends and tastes change for both yourself and/or the kids as the years pass by. THE RIGHT LEVEL: Re-stupming a home demands quality work, so ask the professionals. susceptible to termites. This is more expensive but it is better to do it right in the first instance rather than paying for it again further down the track. It is also important that you hire a professional so that you are getting the highest quality of work. Professional work will not only be safer, but will help to avoid external damage to walls and floors. *For a limited time only. See in-store for details.